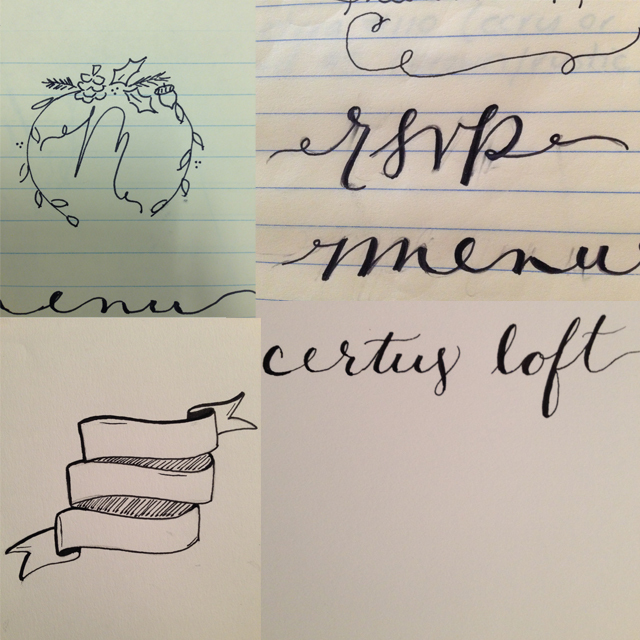 One of the most fun parts of planning our wedding was designing all the things. 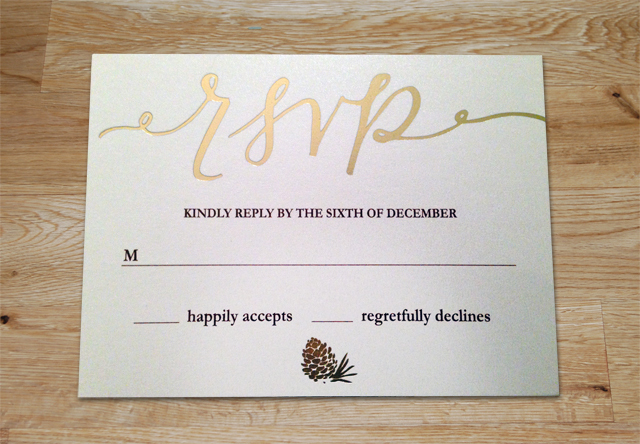 I didn't start out planning to design our own invitations and all the subsequent pieces. But when I reached out to a couple stationery designers and received astronomical quotes for the type of custom work I wanted, I knew DIY was the way to go. I wanted our wedding to be personal, and unique and so I took this chance to be creative. 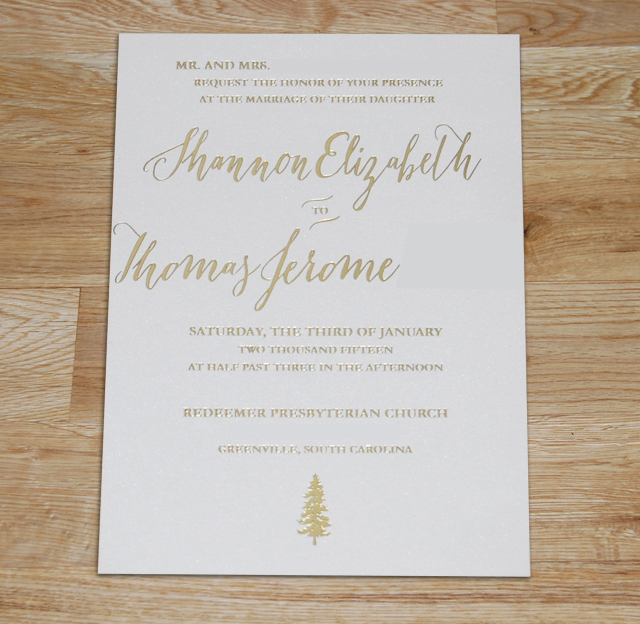 One thing I knew I wanted to incorporate in our formal invitations was gold foil and so first I had to find a place to print them. If I couldn't find a vendor to do the gold foil press and the professional print work for a reasonable cost then it wouldn't be worth doing it myself. I did a ton of browsing on Pinterest and especially Oh So Beautiful Paper. This pretty site shares lovely designer work and also tells you who created it and where it was printed. 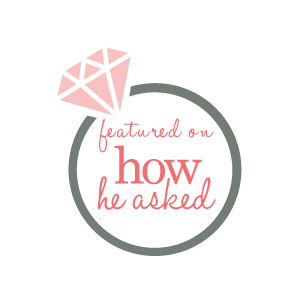 I looked into several different options and eventually reached out to Stationery HQ where I was able to get wholesale pricing thanks to my little design business. They are set up so that I could upload my own designs, select the perfect paper from tons of different styles, folds, thickness, and they do the all printing. The turn around for printing time is 7 days and yes, they offer dreamy foil press in all sorts of colors! I was so excited about this find, and their fantastic customer service, so I got to work. For weeks ahead of that time, along with doodling my soon to be new married name all over everything, I'd been sketching ideas and doing mock ups and it was finally time to turn my pages of sketches into real pieces. 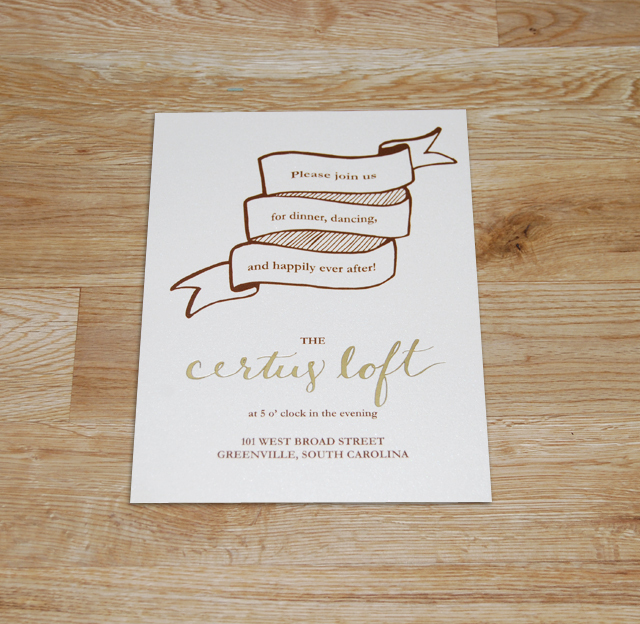 Like my Save the Dates I wanted to incorporate my own handwriting into the invitations so I drew out the words and then scanned my designs into Illustrator. 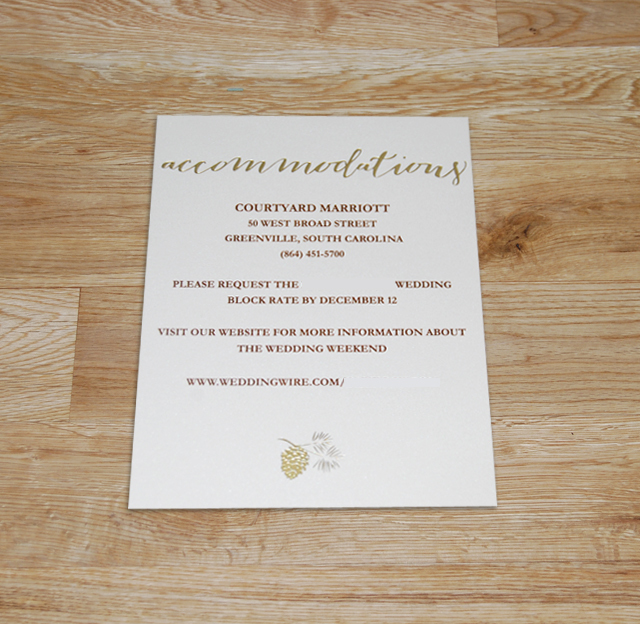 I also found myself inspired by pine cone and evergreen graphics and ended up tying them in throughout our wedding decor. I liked how these elements gave us a subtle wintry theme without being Christmasy and they were also a nod to our new home in the Evergreen State. It's hard to tell in these pictures, but the paper is a pearlescent ivory color which gave all the card stock a really subtle shimmer. To complete the suite I ordered kraft paper envelopes for the set and a sage green envelope for the rsvp cards from paper source. My mom hand addressed all the envelopes in her beautiful cursive (I know, she is the absolute best, and she also proofread everything and caught where I mispelled South Carolina....) and I designed and ordered a stamp from here with the return address, which we stamped in brown ink on the flap of the outside envelope and on the front of the rsvp cards. 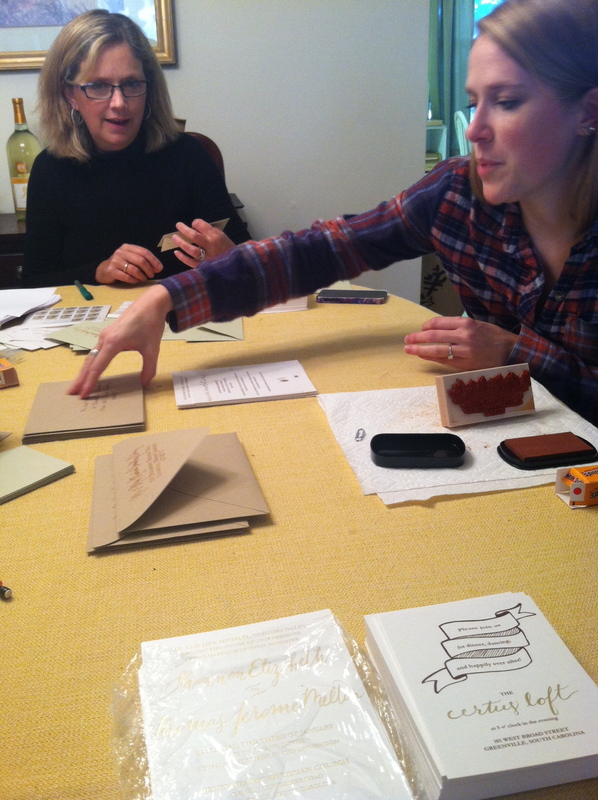 I spent a lot of time designing and pouring love into each piece of our invitation. 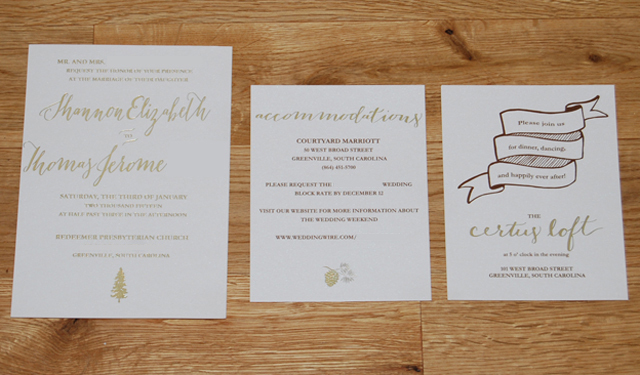 I am still so proud of how they turned out, simple, clean, but also whimsical and rustic. It was so exciting to get them back from the printers and to hold my designs in my hand. I think they did a perfect job of setting the tone for our wedding and gave our guests a little sneak peek into what the day would look like. Exceptional, to say the least! You did a great job and I know everyone that received an invitation felt special and knew that a whole lot of love went into each one. Everything about your wedding is beautiful. Really enjoying your Mom's posts too.